Well, our barn lost a boarder (taking horse home to rehab) and everything with turnout had to be rethunk. The owner and barn manager are very cautious about pairings, and they were concerned about finding Harv a quiet buddy as he is "elderly." Now back in the day, Harv could go out with almost any horse. He liked to be dominant but didn't force the issue. Harv and Ri seemed like a natural to me, and since Riley does not go out in rain Harv needed a "backup buddy." I suggested Eddy. Both Riley and Eddy are young, nudgy, and active. The owner and manager were skeptical about either horse pairing well with Harv. I did take their concerns into consideration. Harv does look more frail--even in the past year I've seen a decline. But he has his spring chicken moments too. So today we paired Harv with both Eddy and Riley, Eddy in the am, Riley in the pm. So far, both pairings went fine. Harv had to set a tone with Eddy, which means he bellowed a few times and raised a hind leg when Eddy got too familiar. Within an hour they were scratching each others' withers. 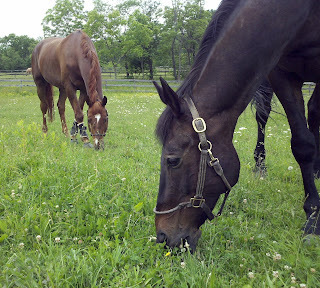 Riley and Harv could have been long time friends (they are stabled next to each other). Let's hope this continues. Always nice to find the right turnout buddies. My Boys do well together with a few little arguments now and then but nothing to worry about. And even better for you to have your two Boys together. I have to suspect Ri-Ri and Harv know they are "brothers," so they have a family obligation to get along. Good going. Hope it keeps up. My new mare kicked him once to prove she could, and now they are the best of friends, I LOVE watching them play together! I DO get teased a lot though because they look like they're related, both dark bay/black with a star and 2 hind whites... silly kids! What a fabulous picture! Oscar's been moved from the teeny paddock he shares with his owner's other horse (who's moving elsewhere for training) to a big grassy pasture where he's made friends with the other horses already resident. Happy summers ahead, all around!